The Cero innovative sliding door system is designed by Solarlux to create openness within the living space using its extensive glass panes, flawless design and impressive dimensions. This contemporary product has assisted Mr & Mrs Andrews in realising their dream of building a modern home with an almost seamless transition between the internal and external living spaces. Mr & Mrs Andrews purchased the building plot two years ago (the land originally formed part of a large Victorian house garden which is now home for the new property) with a very specific idea of the living space they wanted to create. Their dream was to build a new home based on a design previously seen in Arizona USA and subsequently that they had fallen in love with. 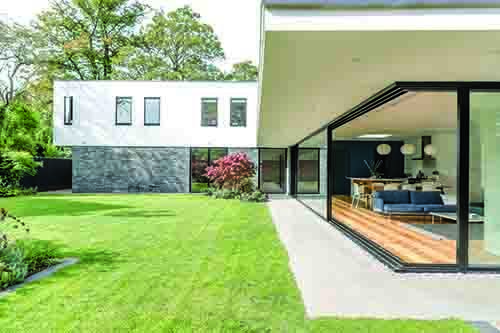 The multi-award winning Cero sliding door perfectly combines technology and design, offering the aspired aesthetics and design characteristics required for the build whilst providing exceptional thermal insulation (U values as low as ≤ 0.80 W/m2K) as well as peace of mind due to the products inbuilt security measures. The use of the Cero product enabled them to realise their true aspirational dream of bringing the outdoor world into their home, from a safe and secure position whilst flooding the living space with natural light, creating a oneness with nature and a true sense of well-being.